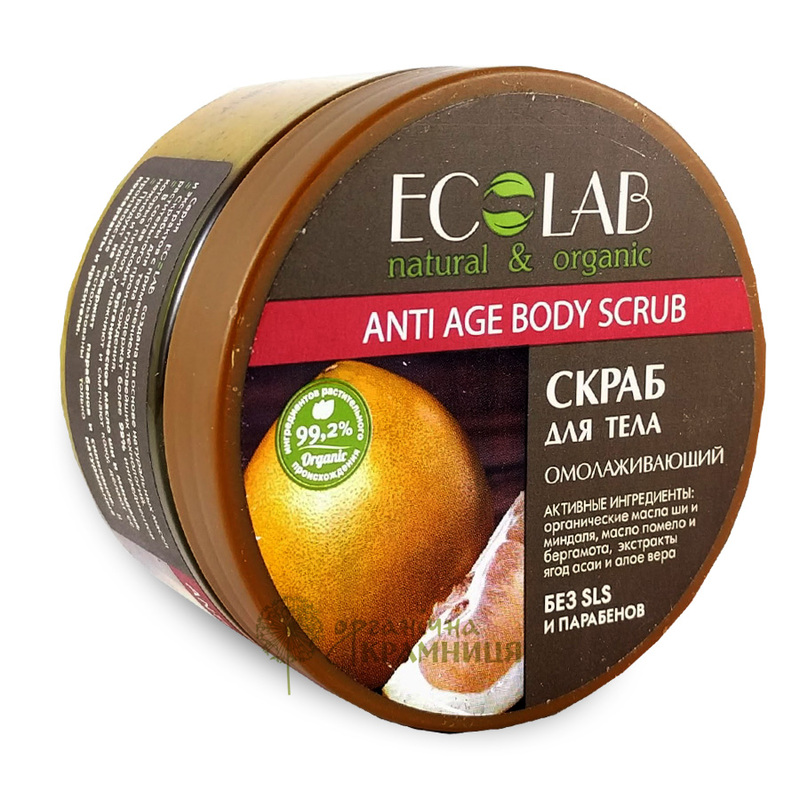 Anti Age Body Scrub is produced by the Russian beauty brand Ecolab (EO Laboratorie). Its active ingredients are organic shea butter, organic almond oil, bergamot essential oil, pomelo oil, acai berry extract, and aloe vera extract. Sugar acts as an exfoliating agent. The scrub contains 99.2% ingredients of plant origin. SLS free. Paraben free. 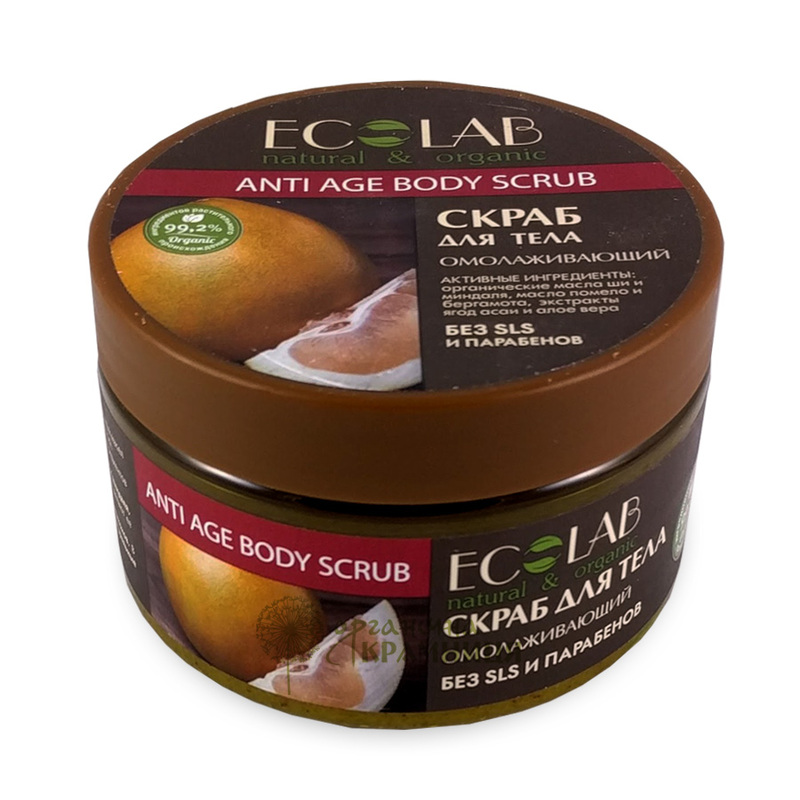 Shea (karite) butter and sweet almond oil contained in Anti Age Body Scrub by Ecolab provide the skin with moisture and nutrients, have a strong softening effect, make the skin supple and silky smooth. These oils prevent dry and flaky skin. Pomelo seed oil and bergamot oil have a toning and moisturising effect. They also have rejuvenating and smoothing properties. Aloe vera extract deeply moisturises the skin, helps to cleanse pores, stimulates skin cell regeneration, and has a lifting effect. Acai berry extract has a refreshing effect on the skin, makes it firmer, and provides the skin with vitamins. It is also known for its antioxidant properties. Directions. Apply to wet skin, massage, rinse. Ingredients. Sucrose, Оrganic Butyrosperum Parkii, Aloe Barbadensis Extract, Organic Prunus Dulcis Oil, Euterpe Oleracea Extract, Cetyl Alcohol, Citrus Bergamia Essential Oil, Citrus Grandis Seed Oil, Perfume, Sodium Benzoate, Potassium Sorbate, Sorbic Acid, CI75810, CI 75125. Want to buy Anti Age Body Scrub? Call us or submit your order via our web site! EO Laboratorie is a natural cosmetic brand owned and produced by the Russian company OOO EkoLaboratoriya (OOO Greencosmetics) based in Moscow. Founded in the early 2010s, the company originally manufactured cosmetic products under the brand name Ecolab. Although the rebranding happened a while ago, many consumers still refer to the brand as Ecolab. Ecolab cosmetics are formulated with natural and organic ingredients of plant origin. Each product contains 92% to 99% plant-derived ingredients. The company produces an impressive selection of products for hair, skin and body care. It offers several product lines (Face Care, Hair Care, Body Care, Men Series, Baby Care, SPA, LovEcOil) which include products for all skin and hair types. Along with personal care products, the brand offers hair styling products, handmade soap, bath salt, bath bombs, cosmetic oils, and gift sets. EO Laboratorie prides itself on producing high-quality products free of potentially irritating, allergenic or harmful synthetic ingredients. Its products are free of SLS (sodium lauryl sulfate), SLES (sodium laureth sulfate), parabens, silicones, EDTA, BHA/BHT, petrochemical derivatives, artificial colourants, phthalates, GMO, etc. All herbal extracts and oils contained in Ecolab products are obtained without the use of chemical reagents using methods such as cold pressing, steam distillation, etc. EO Laboratorie cosmetics are manufactured using the latest technology. The products are not tested on animals and are completely self for human health and the environment. Due to its environment-conscious approach, Ecolab produces high-quality, natural products while contributing to preserving nature for future generations.